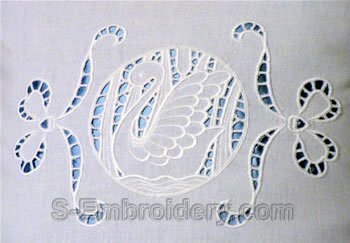 A beautiful swan lace embroidery set. 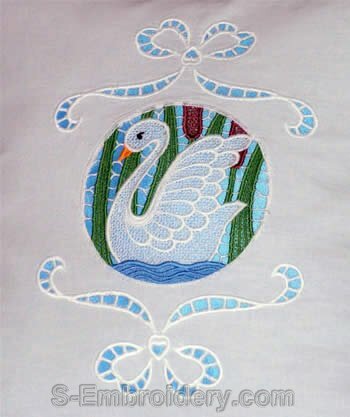 This machine embroidery set includes 3 variants of a swan design: 1 freestanding lace design and 2 cutwork lace embroideries and 2 cutwork lace embroidery bow designs which make a nice supplement to the swan embroidery. 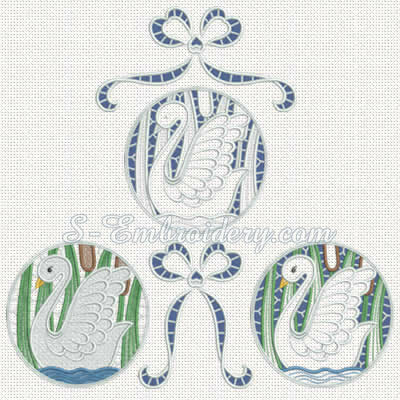 The designs from the swan set would make fine decorations for pillow cases, table cloth, etc. All designs are available in 2 sizes. The large designs are available ONLY in DST, HUS and PES formats. The set includes a total of 5 embroidery files. 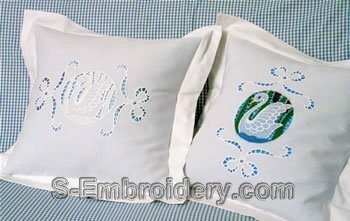 Note: The pillows on the example photos below have an additional blue satin pillow case below the embroidered one.